(Newser) – The Czech Republic, possibly taking its cue from how its neighbors aren't known as the Austrian Republic or the Slovak Republic, wants to change the name it's known by internationally. 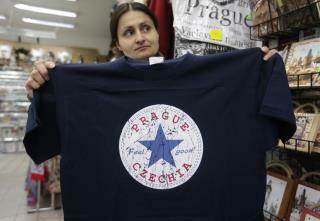 President Milos Zeman and other officials announced this week that they plan to ask the United Nations to update the name to "Czechia" instead of the longer name it has been known by since Czechoslovakia split up in 1993, the Guardian reports. The country, which hopes to use the new name in the Olympics this summer, already uses "Czech" on export beer labels and its international hockey team's uniforms, but because Czech is an adjective, it's like referring to France as "French," the BBC notes.